In an era of massive and complex data, clustering is one of the most important procedures for understanding and analyzing unstructured multivariate data. Classical methods such as K-means and hierarchical clustering, however, are not efficient in grouping data that are high dimensional and have inherent multiscale structures. This paper presents new clustering procedures that can adapt to multiscale characteristics and high dimensionality of data. The proposed methods are based on a novel combination of multiresolution analysis and functional data analysis. As the core of the methodology, a clustering approach using the concept of multiresolution analysis may reflect both the global trend and local activities of data, and functional data analysis handles the high-dimensional data efficiently. Practical algorithms to implement the proposed methods are further discussed. The empirical performance of the proposed methods is evaluated through numerical studies including a simulation study and real data analysis, which demonstrates promising results of the proposed clustering. 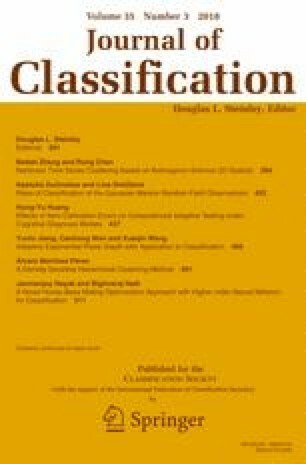 We thank the Editor and referees for comments which led to a substantially improved manuscript. This research was supported by Basic Science Research Program through the National Research Foundation of Korea (NRF) funded by the Korea government (NRF- 2016R1C1B1006572 and NRF-2018R1D1A1B07042933) and by NIH grants (R01HL111195 and R01MH109496). Hansen, J., Ruedy, R., Sato, M., Lo, K. (2010). Global surface temperature change. Reviews of Geophysics, 48, RG4004, https://doi.org/10.1029/2010RG000345.